This buck was taken on the third day of the second season. He's about a 14 incher and was taken with one shot. This is my best pronghorn to date, and was my first ever. The rifle is a custom Remington model 700-BDL chambered for the 257 Roberts Improved (P.O. Ackley design). Handloaded Speer 120 grain Hot Core's did the job nicely. Our party included Bob Brancati, Bob Sutton, and myself. 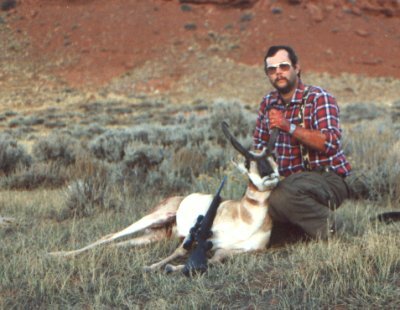 We all took pronghorns, and Bob Brancati and I took nice mule deer bucks as well.